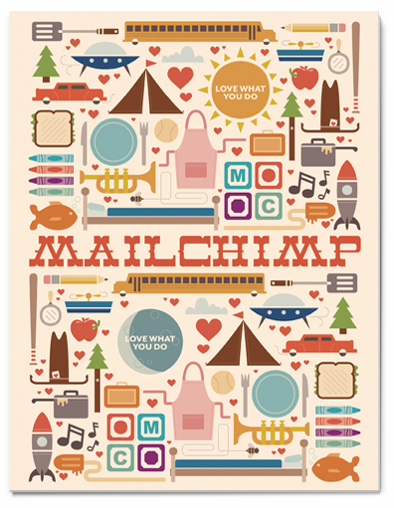 As if Mailchimp couldn’t make me love them any more, they keep doing it! Check out this Mailchimp Coloring Book drawn by @justinpervorse. I was lucky enough to receive an actual printed copy of the coloring book and I can’t wait to show it to my daughter! Who wouldn’t want to color in a chimp? When I thanked Ben, the founder of Mailchimp, he filled me in on why they made them to begin with. Apparently, the marketing team, without Ben’s say, added a small line at the bottom of their site that says “Love What You Do” which some people perceived as Mailchimp’s tagline. I, in fact, have noticed that line and pointed out to several people as I thought sending such a simple powerful message in something trivial as the footer was a fantastic idea. The design lab staff looked at him in a weird, confused kinda way, but then they smiled and got to work. You can read about it all over on theirMailchimp blog. I can’t help but think that working at Mailchimp must be quite a pleasurable experience. Do you have a little one? Then you should download the PDF of the coloring book. Love this post. Well done and a great way to remind people how important passion is!